It’s fall! As usual, I have mixed feelings about it. 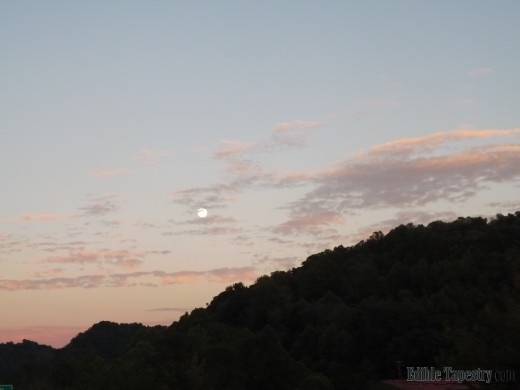 On the one hand, it’s my favorite season, but on the other, summer is over and I am not home in my Smokies to watch fall happen, though two trips to our mountain farm are planned before the leaves are finished doing their thing. I am homesick but am having a blast up here further north. Especially when it comes to putting together a new home for my family and exploring more of this beautiful country. 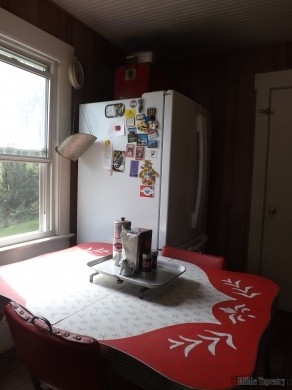 Practically taking my kitchen with me certainly helped ease my jittery mind through the transition. I no longer have my painted walls (Paneling. Ick!) 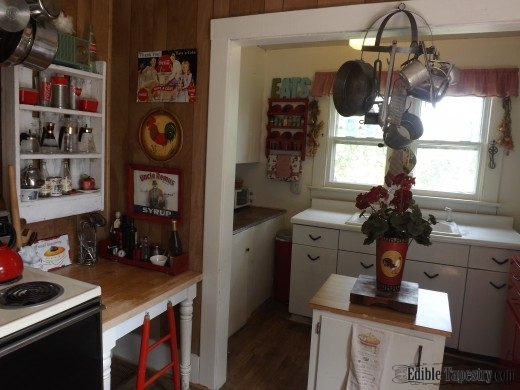 and black and white checkerboard floors, but I am still in retro red kitchen heaven. Some things are new, like the little hutch I threw together from spare salvaged parts just before we moved. I’m so glad I did. 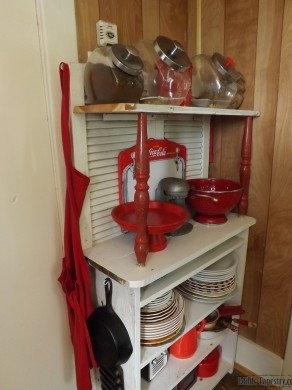 It fits this corner of the kitchen perfectly and adds valuable storage space, since I no longer have all the built-ins of our last kitchen. 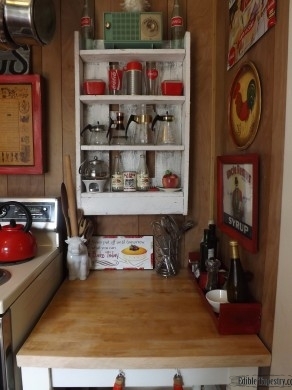 The butcher block table, whose rounded sides we sawed off, just fits next to the stove and makes a fabulous prep space. And I joke about “moving the kitchen”, but I kinda did. It only took me a few weeks to decide that I could not continue fighting with the little fridge that this house came with. It’s been decades since I’ve had to deal with a freezer the size of a microwave that frosts up overnight. So, since I had to leave my WHOLE farm, I brought my favorite appliance with me — my big French door refrigerator. This thing is going with me wherever I go. And I think it’s not really home till you get the refrigerator magnets up. Agree? Leaving our very dark living room furniture behind and decorating in a color and style that I never imagined I’d choose has been fun. 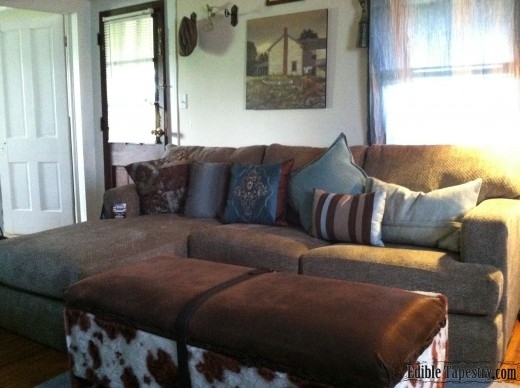 The cow bench I made years ago, which served as a storage coffee table in the converted stable on our Smoky Mountain property, suits our new mocha sofa well. With the cow bells I inherited from my godmother and the farmhouse picture that looks almost identical to the one we now live in, we are in plush/rustic paradise, here on the dairy. 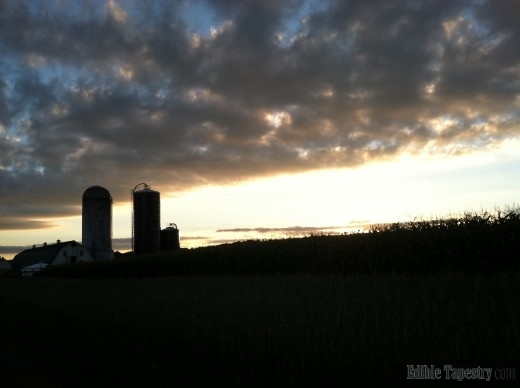 The sunrises and sunsets here, near Amish country, still take my breath away. 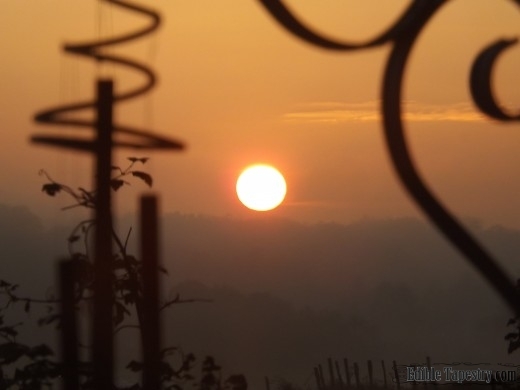 How nice that the earth gives us a show as the day comes and goes. And a Super Moon, to boot! Lovely. 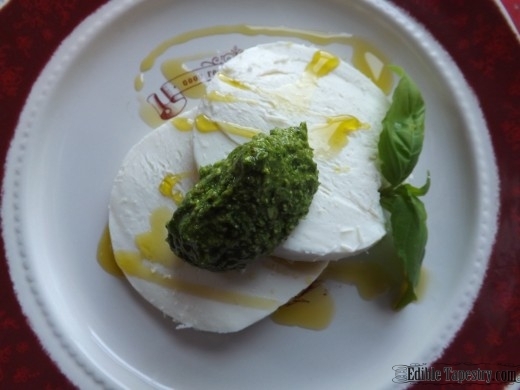 At home I’d be celebrating the first day of fall by making pesto for the freezer with the overabundance of basil from my garden. 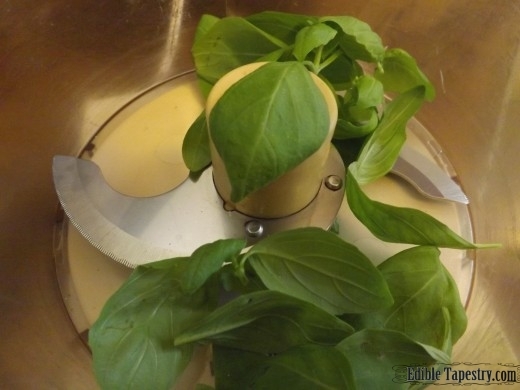 But I don’t have my garden, just one little basil plant in my kitchen window. 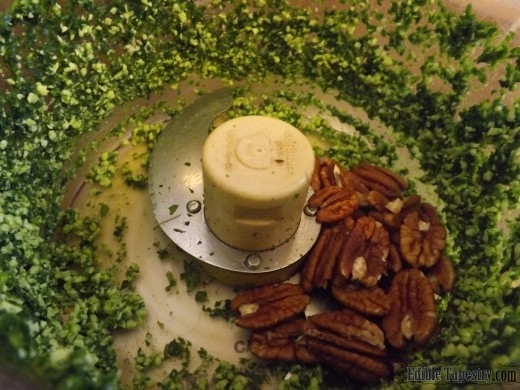 The idea of fresh pesto, however, was too tempting, so I pulled out a hunk of asiago, a bin of baby spinach, and a jar of pecans and set about making a small batch to serve atop fresh mozzarella slices, alongside the penne and meat sauce I have planned for dinner. Some of the tiny Roma tomatoes I brought from the Smoky Mountain farm will be a nice accompaniment. 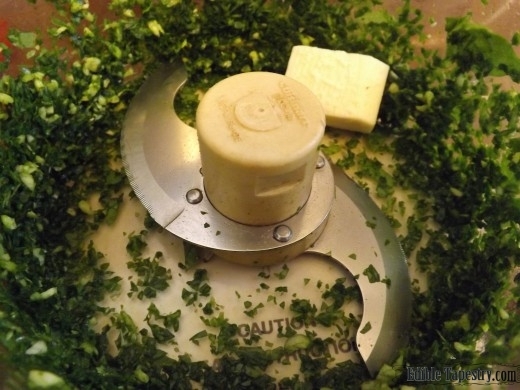 Place the basil and spinach in the bowl of a food processor. Whir until they are finally minced. Add the garlic and process. Do the same with the pecans. 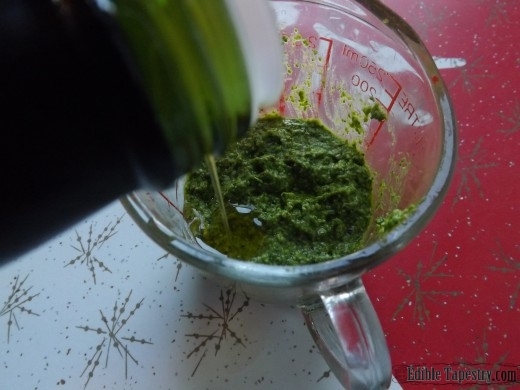 Drizzle in the olive oil. Season with salt and pepper. 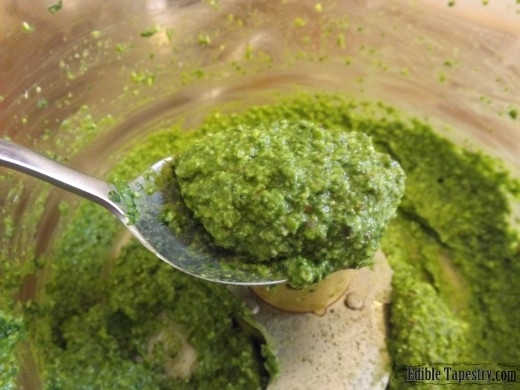 Cover the top of the finished pesto with a little oil to prevent it from turning brown before it can be used. « Exploring the Mason-Dixon Line in the Central Appalachians & a Pickle Recipe from My Home Away from Home.